On the face of it this tremendous six song mini album could be looked at as a solo project by Keith Marlowe, albeit with the support of some quality musicians. This, thanks to the fact that he wrote all of the songs, plays guitar and takes all lead vocals, also having produced and recorded the album in his own basement studio. As you listen to the album repeatedly it becomes obvious that this is very much a ‘band’ album thanks to the depth of feeling that has been put into these excellent songs by a crew of talented musicians. The core band is made up of the already mentioned Keith Marlowe, with Andy Shahan on drums and backing vocals, David Thornburgh played pedal steel guitar and usually Scott Donnini is on bass and backing vocals, but did not appear on this album. Other musicians that helped out are Jim Callan, Joe Kille, Matt McGuire and Jeff Smith. There is some tremendous playing and singing on this album that can really be described as ‘classic alt. country,’ having a nice modern feel with it’s chiming, jangling, hard driving guitars always supported by the gorgeous pedal steel guitar. Marlowe’s vocals are perfectly suited to this music, having a nice raw edge but with an ability to vary the tone and atmosphere. Rebellion. 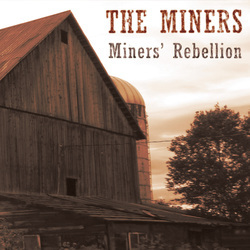 This is a tremendously sad story with chiming electric and steel guitars with excellent vocals on a tragic tale about the ‘Miners Rebellion.’ This could well be the bands defining song with the arrangement, playing, singing and raw passion being just about as good as you could wish for on this powerful tale. It is followed by I Recall a real country song of regret with nice fiddle and steel guitar giving tremendous support to the evocative vocals and edgy harmonies. There is the mid tempo jangling country ballad Doggone, as well as several other excellent songs, all sitting comfortably withing the boundaries of alt. country with perhaps a little country rock added for good measure!